Earthwise Pest Management is a commerical and home pest control company serving Sacramento, Folsom, Roseville, and beyond. In case you are a prospective customer wondering what “earthwise” might mean, it comes from our environmentally-conscious approach to pest and rodent removal. We utilize Integrated Pest Management (IPM) techniques in order to keep the environment in mind while performing residential or commercial pest control services. We are passionate about providing local households and businesses with affordable and effective solutions to any pest control issues they might have. If you have a termite control issue, give us a call. Got bed bugs? We are experienced in bed bug treatment. Have a rat problem? Check. We solve the problem and are experts in future prevention as well. Positive reviews and testimonials mean a good deal to us. Of course, the same thing could be said for many a company, irrespective of industry. In today’s world of instant access to information, more people are using reviews to guide their decision-making when it comes to anything from choosing hair products to selecting a local pest control company. If you were to stop and take a moment to consider the psychology behind someone leaving a positive versus a negative review, you might come to the realization that it’s much more natural to let people know about an unpleasant experience with a service or product than a pleasant one. People don’t usually take time out of their busy day to comment on services received that met expectations. After all, they paid for said services. That’s why we are proud to highlight a few of our favorite testimonials and positive reviews left by our awesome customers, many of whom have become long-term clients. Keep reading, and you just might find yourself in the same boat! 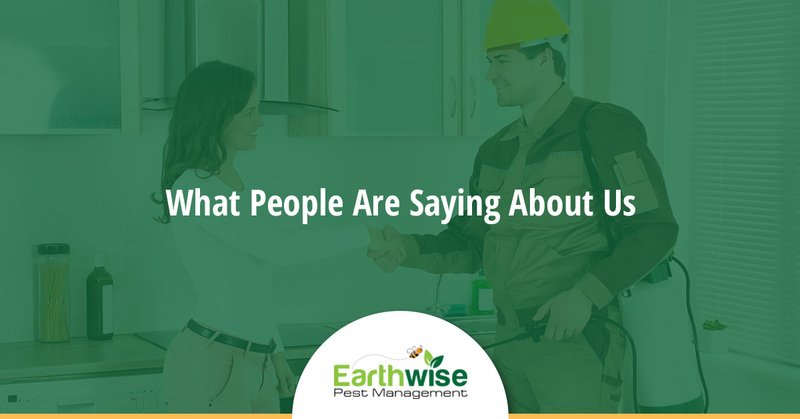 Thanks, Nadine, for taking the time to let us and others know about how your experience was while working with us at Earthwise Pest Management. As Nadine noted, we do our best to be as communicative with our customers as possible throughout the entire process. From free estimate to the job’s completion, we will be respectful, punctual, and thorough. Oh, and thanks for pointing out our track record of positive reviews online, Nadine! We wanted to point this five-star review out in particular, not only because of the kind words but because Brandy is an official local guide. Thanks, Brandy, for the five-star review! Jim, we are very pleased that you are very pleased! It’s nice when that works out, especially when the topic revolves around the topic of termite removal services. As Jim pointed out, we do our best to not be too “salesy” during any part of working with our customers. We’ve spoken about how thorough and communicative we strive to be on every job and with every client, so it’s nice to hear that sentiment echoed by multiple clients. One thing we haven’t yet mentioned is our competitive pricing. We make pest and critter control affordable. The final review we want to point out today is one which, dare we say it, makes us blush just the faintest amount. Those are some wonderful adjectives to be associated with, Tracy, so thank you. We are grateful for your business and for you letting others know what you think of our Sacramento rodent control company and Kyle specifically. At the end of the day, you want to feel comfortable with people helping you solve commercial and home pest control issues. Whether your need is commercial or residential in nature, we have the experience and top-class staff to help solve your problem. When you throw in the fact that we do so affordably and in an environmentally-conscious way, it’s just gravy! Give us a call to get your free estimate scheduled. We’d love to earn your business!